Adelheid "Queen of the Moonlight Corrosion"
Strauss' queen and purportedly Bridget's sister, Adelheid was sealed a thousand years ago when she went berserk and unleashed her power, the Moonlight of Corrosion (Fushoku no Gekkou). Legend says that she thought that the king had been killed. 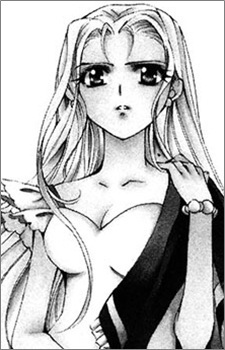 Adelheid had a shy and self-conscious personality and she always worried about how others thought of her. When Adelheid first learned that Bridget was her sister, the future queen felt very guilty over the circumstances of her birth. Adelheid always tried to make it up to Bridget by calling the dhampire ‘dear sister’. Unlike Bridget or Strauss, Adelheid does not possess an exceptional amount of brains or cunning. By comparison, Adelheid was the least skilled of the three but since she was the only pure-blooded daughter of the king, Adelheid was the only one who could become queen.